Liam Healy is a Senior VP and Managing Director at Diligent. He’s led commercial operations at Board Effect which was acquired by Diligent. Before that, he was at Vocus (now Cision) and the Corporate Executive Board. Interestingly as well, he’s spent 8 years in professional baseball, in the Kansas City Royals and other organizations. Liam Healy: Thanks for having me, Fred. It’s great to connect, I know you’re doing great things, I’ve listened to a bunch of the podcasts so it’s exciting to be a part of it and certainly humbled for the opportunity to speak with you. What else to know about me? I grew up in Baltimore so I am a native “mid-Atlanticker”. Moved down to Virginia as my sales career blossomed after 8 years in professional baseball, live in False Church with my wife and have most recently been spending a lot of time, about 35, 40% of my time internationally so back and forth to London. Heathrow to Dulles is a shorter trip than you would expect. Fred Diamond: Very good. I’ve done that trip a couple times as well. Tell us what you sell today and tell us what excites you about that. Liam Healy: Diligent is all about governance and so as a software company our mission is to improve governance so good oversight from boards of directors and the individuals that support the work of the board overall to help guide the decisions that are being made for all types of organizations both large and small, so by providing them the right sets of tools whether it’s for the board of directors so applications that take what used to be done in 3 ring binders and now putting that into software all the way through to legal operations technology that help the individuals support the work of the board to get that curated material ready for those types of meetings. Basically take it out of a very manual process and put it into a more efficient effective type software process. The exciting part about that is if we get that right we’re inflecting some of the biggest organizations in the world with the most important missions in the world to influencing their decisions indirectly. Fred Diamond: You’ve got boards that are running some of the largest companies in the world as well? Liam Healy: We do. Across our organization with Diligent we have offerings for not for profits, for higher education, healthcare, for profits public and private so everything from the largest financial institutions in the world that are highly regulated and so we can imagine what happens behind the doors of those board meetings as well as not for profits that are local that need to make important decisions around philanthropic missions. Fred Diamond: Is it a competitive space? Are there a lot of companies that do this as well or with all your acquisitions are you pretty much leading the charge? Liam Healy: If it’s competitive, yes. We will certainly entertain a meeting with them. No, it’s something that when I got into the space I hadn’t thought twice about. Certainly coming from an athletics background governance probably not the sexiest thing that you talk about or think about but getting into it you realize how important it really is and so from a competitive landscape there are organizations that are doing one piece of what we do. We’ve been fortunate enough and thought leading enough to coin the phrase Governance Cloud which brings it all together for good decision making, good decision making doesn’t happen in a silo but there are certainly worthy organizations out there doing one piece of what we’re doing across the globe. Fred Diamond: Before we talk a little bit more about your career, who do you sell to? I know what types of companies you mentioned but who specifically purchases the software? What are some of the key titles that you focus on? Liam Healy: Good question, a couple different questions in there. I think that the users of our product are boards of directors so we’re trending towards the direction of having a million board members using our product. That’s some pretty healthy real estate, and then the individuals that support the work of the board. Listeners that have had direct interaction with the board will know curating materials to get ready for a board meeting, things on page 1 can’t be wrong or the rest of those materials are probably wrong but as a director I don’t think enough individuals think about the travel they have to go through and their fiduciary and philanthropic responsibilities to govern an institution. Those are the users, but from a purchasing, as a sales leader who are we going after? How are we going after them? I think research would suggest anywhere from 7 to 8 individual stake holders will touch a particular purchase so certainly the general counsel will have a final say a lot of times but we’ll be given direction if it’s top down coming from the board. “Hey, I sit on my Alma Mater and we use Diligent and I also sit on this large financial institution, we should also use Diligent”, top down approach, but from the bottom up approach it’s very much around efficiencies so the individual is doing the work for the board. Legal specialists, general counsel, corporate secretaries, associate general counsels will all have a sometimes tax or compliance or risk leaders will get involved, so a lot of different ways that we could enter. Fred Diamond: Very good. We mentioned during the introduction that you spent 8 years in professional baseball. Fred Diamond: Tell us how you first got into sales as a career. Liam Healy: Complete happen stance. I think what my peers and athletics would tell you is that they don’t teach you a whole lot of business acumen while you’re taking batting practice. Then I had an opportunity to work at CEB but getting into CEB, I think they are quite rigorous and probably still today offers a rigorous interview process so reading stall points, a fantastic HBR read from CEB, understanding and digesting that material, pitching it back to the recruiter. You get past that process, you’re going to have another round of interviews over the phone before you ever get in the door and then a multi-step process, three interviews in the same day. Again, complete happen stance and I was fortunate enough to have digested the material and be able to pitch it back which we’ll talk a little bit about later I think, probably, and trick them into hiring me and then it has gone really well since then. Fred Diamond: Usually at this point I’ll ask the question, “What are some of the key lessons you learned from some of your first few sales jobs” but again, you reached some pretty good levels within professional baseball. Let’s talk about that a little bit, are there things from your baseball career that have helped you become a successful sales leader? Liam Healy: Yes, it’s really interesting. As I’ve matured in my career and overall, I’ve become quite introspective and reflective of my career. How coming out of baseball 8 years and professional athletics a lot would say, “Wow, that’s amazing.” That’s their first knee jerk reaction, it’s very much my peer set had moved along and were now leading organizations in some cases. It really did feel like a stall point in my career but the intrinsic or inherent values I think that come out of individuals that have gotten to that level of athletics, even humbly saying, things like passion and drive and persistence and hard work, resilience, along with having to learn how to be humble. Wrap it all up in a band of humility, if you will, is hard but it’s quite transferrable so getting into my professional career I found out quite quickly that it transferred, it helped to drive who I was and how I went about what I did. The level of rigor that I put into achievement and what that meant to me personally, not just for the organization at CEB when I first started what that meant for them, obviously, but how it would move me along. Now as a leader of leaders it’s an opportunity for me to say, “Behavioral characteristics are so much more important than the skill set that someone brings to the table. They can learn a skill set, someone can learn a skill set over the course of time but what sorts of behaviors have they learned over the course of time? Really important. Fred Diamond: Tell us a little more about what you specifically are an expert in. Now you’re selling governance software for boards of directors. Is that something you knew about a couple years ago? Liam Healy: It is not, no. When you say governance I feel like eyes glaze over in general which is interesting because my wife is deep in governance. She’s an associate general counsel within her institution. Which led into a much deeper discussion around the challenges that those users have that to me very quickly unlocked where the future potential of this world could go and we have, we’ve gone quite quickly at Diligent which is great. Fred Diamond: What are you specifically an expert in? What is your area of brilliance? Liam Healy: I don’t know that you’d hear many people use the word expert and or brilliance in my company unless talking about others. I think in particular I’ve matched up preparation with opportunity well. I learned early that luck is the residue of design, if you will, and if you’re prepared, if you’re forward thinking in what could happen or how it might happen when opportunity presents itself so you can move a bit more quickly. With that I would say I marry that with I’m not afraid to take risk, I’m very much a believer in get it 75 to 80% right and keep moving and you’ll learn a lot as you’re going philosophically. You can make changes as you grow and so for me, I would say marrying the opportunity with being prepared, taking some risks, I think solving problems I really enjoy. If you would ask around – and actually, I had someone tell me this the other day – maybe I’m a glutton for punishment. I seek out really tough challenges which I didn’t know by myself but I have come to find that if something seems like it’s a big challenge or broke and I end up gravitating towards it from the business lands and working to make it right, I have also learned about myself that I have a fairly quick learning curve. I don’t read all that well, I read very slowly actually. It’s one of the things that I have spent more time on, I read quite slowly but I listen and I digest materials quickly so I’ve learned that about myself as well. It has helped me to amplify and shorten my learning curve in a lot of areas. Taking that I’ve been able to take in information, shorten the learning curve and then with some of that risk and moving in 80% of the information, I move pretty quickly. Fred Diamond: I want to ask you a question back to some of the baseball. Again, I could talk to you about baseball and your career, we could talk for the next 4 or 5 hours or anything. Liam Healy: It would be boring. Fred Diamond: [Laughs] Not to me! When you think of yourself as a sales leader – and again, when you were a professional baseball player you’ve obviously had managers and coaches and probably ranged all the way from hard nose to rah-rah if you will, how do you position yourself as a sales leader? Are you kind of a rah-rah kind of a guy because of your background baseball or are you more of a hard-nosed, detail-driven sabermetrics kind of a guy? How do you position yourself, Liam? Liam Healy: It’ll be interesting after I think some of my peers will tune in and listen, it will be interesting to give me the 360 degree review here on this one. To answer the question, from a positioning standpoint I think I lean more towards rah-rah and empowerment and I’m very much on the Bill Parcels kind of mentality of when you’re down you don’t need to be beaten down more but when you’re up you probably don’t need to be as high as you’re probably thinking you are so let’s play ball. That said, I think at heart where I will gravitate – and again, from an introspective look – is towards the operational metrics. I will get in the weeds and roll my sleeves up and start to figure out what makes this “work” and then how can I replicate it and is that scalable? While I position myself as the happy-go-lucky depending on when you meet me or see me, ra-ra mentality I’m very much operationally mindset. Fred Diamond: Again, you’re selling governance software as well. Talk about a mentor. Again, you’ve worked for some great companies. You started your career at CEB now Gartner, you worked at Vocus which of course has a great sales lineage – we’ve had Chris Cutino on the podcast, he did an absolutely fantastic job. Tell us about an impactful sales career mentor and how they impacted your career. Liam Healy: The list is long, I’ve been very fortunate. Again, coming out of an 8 year professional athletics career and then stumbling across at your first gig is at CEB which is basically your MBA in commercial sales. I was surrounded by individuals like Paul Ironside who I know you’ve spoken with Vineeta (Mooganur) and Reed (Fawell) who have come certainly from CEB. Paul Ironside’s name is one that rings out all the time. Fred Diamond: Fred Diamond: You’re talking about Vineeta Mooganur who’s now at Hanover Research? Liam Healy: That’s right, she was instrumental and how I would be more reflective and thinking through and being more qualitative on how I thought and her husband Praveen, Praveen Mooganur who was one of my first interviews which I’m sure we’ll talk about here in a few minutes but Praveen, I see him from time to time and bounce ideas off him. He’s been great and Rick Rudman at Vocus, the CEO, Steve who grew monster.com to what monster.com was at the time and then came to Vocus in his later stages, still a mentor to me. Tod Gibby who grew sales at Blackboard was my CEO at Board Effect and then I think I have an amazing relationship with our CEO, Brian Stafford and our head of sales, Jeff Hilk, and our head of operations, Laura Gardner who also came from Blackboard now. I’ve just been continually surrounded by really smart people that I’ve been able to continue to learn from. What have I taken away from that? I think if I distilled it all down I would bring it down to one of the things that I think about all the time which is simplifying it to quantity and quality. Proverbially or philosophically you can do a whole lot of something or you can do it really well, or you can do a mix there of – you can do a whole lot of something and do it really well and you’re a super star. You could do not enough stuff and not do it very well, probably not the right mix. Or something in between and I think boiling it down or distilling it down to that sort of methodology has allowed me to navigate a lot of different issues. Fred Diamond: As a sales leader, what are two of the biggest challenges you face? Liam Healy: I would say not just a sales leader but as a leader of leaders, people is my #1, is my sole focus and I have learned that it echoes in my ears day after day that attracting, motivating and retaining the right people beyond a shadow of it out #1 thing that we can do as sales leaders is making sure that we surround ourselves with the right people, we attract those individuals, we keep them, we motivate them and understand them. That’s #1. #2 I would say the velocity that business has evolved, not just sales but business in general. Email and now there are sales individuals that have relationships with buyers that they text, it’s just the proliferation of the different types of media that are out there has just really sped things up and makes it significantly tougher to do business in today’s environment. Fred Diamond: Take us back to the #1 specific sale success or win from your career that you’re most proud of. Take us back to that moment. Liam Healy: I think for me it wasn’t a deal per se, but for me the biggest win in my career was getting the opportunity at CEB which looking back in hindsight had to be managed like a deal. Finding the opportunity and getting in the door and then obviously managing that through to procuring the role, if you will. Again, we talked a little bit about it a few minutes ago but coming out of professional athletics, zero business acumen which at the time didn’t quite know that I had no business acumen but it was brought to light very quickly. In the first interview with CEB, again it’s reading Stall Points, a great HBR read if you haven’t read it please read it. It’s a really deep study that highlights when organizations hit stalls in their revenue growths, how many of them if any come out of that. Reading that and digesting that after being a catcher, an outfielder to catcher convert digesting that and then giving that back to the recruiter so that they could judge my level of competence to see if they would continue to push me forward in the process, not easy. The first things I did was I reached out to my brother. Fred Diamond: I have a question for you about that as a hiring manager now. You kept mentioning a bunch of times, Liam, that you didn’t have the business acumen, that came up a number of times. You took what was necessary to try to be as prepared as possible and you were able to show them that you were going to figure it out and they were smart enough to realize that. How about you as a hiring manager now? We’re here on the floor at Diligent, beautiful offices in Arlington, Virginia. Lot of energy, beautiful offices, people working hard, it’s early on a Friday morning, but how about you when you’re hiring now? Are you willing to look past certain things? 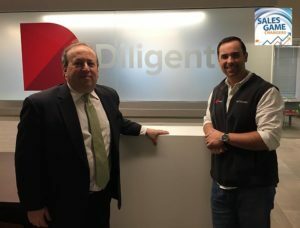 What are some of the things that you look for in a young person who’s looking to get a job in sales with a company like Diligent? Liam Healy: It shaped my career. I had something to prove at that point, for me coming in, the proverbial chip on your shoulder, I am now going to prove what I can do. That exists, so yeah, absolutely. It has shaped how I spend time with people, my level of curiosity, understanding the who they are, if you will, and why do they do what they do. Getting to the behavioral characteristics of someone: are they passionate, are they driven, are they creative? Do they spend time educating themselves? Who is this individual versus my resume says this. I’ve never seen a resume, by the way, that says, “I’m not that good at what I do.” Doesn’t exist. Getting to the crux of who that person is because I do think that over the course of time, especially if you’re going to scale, you’re going to hire 80, 150, 200, 500 people a year in an organization as we are growing at Diligent rapidly, you can’t look for just an expertise thing. You have to bet on people and then you have to motivate those individuals and retain them, so that has absolutely shaped how I interview. Fred Diamond: Did you ever have a moment where you thought to yourself, “They were right, I don’t have that business acumen, maybe I’ll go try to get a job coaching or something like that”? Liam Healy: I suffer from productive paranoia. It’s that intrinsic motivator. When you wake up or you’re driving back from your job or you’re on the metro and you say, “If I just would have done…” X, Y, Z. I think a lot of people don’t know that they do it but it’s that internal drive. I suffer from that, so for me has it ever been to hard? No. Work ethic and coming in and pushing through being persistent has never been an issue. I think I’d be disingenuous if I said that as a sales leader, any of us as sales leaders didn’t have that fleeting moment that we were like, “I should have been a farmer.” It’s like, “I should do something different” or “I should go back to baseball”. There is that knee jerk reaction sometimes when things are tough but I know for me it’s been more about what do you do in those moments, so when challenges arise how I step back and become a little bit pensive and thoughtful about where are we going to go, what are we going to do, how do we do that and set ourselves up for future growth. I think those sorts of setbacks are what have driven me in the past to get me where I am today. Fred Diamond: What’s the most important thing you want to get across to junior selling professionals to help them improve their career? Liam Healy: I think it’s three things. If I wanted to boil it down, three things: First would be educate yourself, spend time and invest in yourself and also surround yourself with people that invest in you. The more you can learn, the better you’ll be and it’s not just about your trade in sales but that’s globally. Investing the time to better understand how global commerce works. The second would be understand the difference between your behavioral characteristics, who you are as an individual versus the skills you’ve acquired over time. Skills can be learned, behavioral characteristics most likely cannot be but they can be shaped. If you’re a passionate, drive, assertive, confident, organized, creative, thoughtful person, amplify that. Turn up the volume on that and spend that time learning your trade, the skills, educating yourself. Finally is keep it simple. It really is about quantity and quality. If you feel like your quality is down, you need to learn about how to do something a bit better, a bit more thoughtful, a bit more qualitative, you have to do more of that to outwork the system. That said, if you’re high quality, just understand the math of that is I probably don’t have to do as much to get a similar result but if you do more you’re really going to blow it out. If you kept it pretty simple like that I think you’d go pretty far. Fred Diamond: Educate yourself and surround yourself with people who support you in that. Focus on understanding your behavioral characteristics and then optimizing that, then of course keep it simple. What are some things you do to sharpen your saw and stay fresh? Liam Healy: I read. Well, I listen. I listen to a lot. Again, I digest information better audibly so I spend a lot of time whether they’re your podcasts, books through audible, HBR, so I read a lot. About lots of different topics, sales, leadership, global commerce, politics, I spend a lot of time immersing myself in education. Fred Diamond: You got those 5 hour flights between Dulles and Heathrow. Liam Healy: It’s probably the best office I think I have in the globe, I get so much done it’s great and I surround myself with people smarter than me. I purposefully choose to spend my time with individuals that I can provide back to but more that I can ask great questions to and get thoughtful 360 degree reviews of the world. I’ve actively chosen to be at a place that invests in me, education. Diligent, we’ve invested in an executive coach and so for me that’s a big opportunity to continue to grow as an individual. I think that’s important. Fred Diamond: Just a quick question, that hasn’t come up all that frequently in the Sales Game Changers podcast. Would you mind sharing something that your executive coach has helped you understand to make you a more productive and effective sales leader? Liam Healy: Communication. For me in particular, I sit at a crossroads of upward reporting to a CEO and the CEO reporting into the board and when I am at board meetings as well but then also downward communication. It’s a crossroad where to shorten it you’re being told what to do or given an opportunity to make those choices and then sometimes you’re giving the downward communication of telling people what to do in its short phrase. I think the communication of simple things like differences of using the right words, can you versus would you. Can you is a favor type question and would you is a will you do this for me type question and by when and how? Simple communication techniques and then upward reporting to the board. They will certainly digest all the information, the board. They want it in the appendix but what they really want is short, to the point information that allows them to have good conversation so that they can ask you the right questions. Liam Healy: Right now it is people focused. It’s not any sort of a reorganization or anything like that but it is more making sure I’ve got the right people in the right place at the right time with the right skills and the right information. For me, again, as a part of the business unit of Diligent it’s working with our executive team so that I can better understand their needs and be a better business partner but then also taking that information and making sure that with my leadership team and individuals across the globe, do they have what they need? What are the other resources I can provide them? And then as we grow we’re going to hire 80 to 100 people this year alone. We’ll be at 700 people by the end of the year. How am I making sure that we bring in the right types of individuals with the right talent and most importantly retain them? It is all around people. Fred Diamond: Very good. Liam, as we wind down the podcast, sales is hard. People don’t return your calls or you emails, they’re not really working on your agenda. Why have you continued? What is it about sales as a career that keeps you going? Liam Healy: I think the easy answer is you control your own destiny. I think we would hear that a lot if you asked a lot of sales leaders is, “I can control how things, the outcomes, from my effort.” I personally think I embrace challenge, I think I wasn’t the most talented in baseball, I didn’t have enough business acumen to get the roles that I had in the past, I had stretch targets everywhere I’ve ever been and I had an opportunity to grow and build something from CEB all the way through to Diligent that is from sheer persistence and hard work and dedication and a willingness to achieve. Again, that’s the definition of I control my own outcomes, it is. But again, it is really what I choose to do. Fred Diamond: Liam, for the Sales Game Changers listening to the podcast around the globe, why don’t you give us one final thought to inspire them? Liam Healy: I think the individual that I left off earlier that has been probably most influential for me was my father in sales and he taught me three basic things: others first, solve problems and look for the fair trade. I live my life by putting things in that lens and thinking through others first. How is the energy that I’m going to bring with what I have to offer, how does that make whoever my audience is better? Whether that’s executive, whether that’s the board, whether that’s my leadership team, whether that’s my wife and my friends and my family, how can what I bring to the table make them better? And listening to identify that opportunity. The second is solve problems. Embrace the challenge, if things were easy everyone would do it. When there’s an opportunity, when there’s a challenge run towards it with open arms understanding that it’s never going to be perfect but I’m going to take the time and dedication to say, “How do I solve this problem to amplify what I’m doing for others?” Then finally the look for the fair trade part took me a long time to better understand and in having conversations with my father about this was if you’re giving, you should be looking for a reciprocal return. You shouldn’t be looking for more than that return depending on how good of a negotiator you are, more than that return or less than that return but there should be a fair trade and that’s healthy, and that’s OK to ask for that fair trade. If that fair trade is you’re a really talented, high performing individual you should go to an organization that’s going to invest in you and help grow your career. If you are a sales person negotiating a deal, quid pro quo, this for that. I’m going to give you something, you’re going to give me something in return. I think that’s healthy and that’s OK but I don’t think enough people think about if that’s fair, but really all you should be looking for is fair. Fred Diamond: Others first, solve problems and fair trade. What did your father do for a living? Fred Diamond: What did he sell? Liam Healy: He was in binding so Prentice Hall. If you ever opened a textbook and you saw Prentice Hall at the front of that textbook, that was my father’s account.